is there a memorial at your school that you don't know about? After the First World War schools all over the country made a massive effort to create memorials for the past students that had fought in the war. School is a special time in someone’s life, and it would have been heartbreaking for teachers to hear about past students (that they remembered as children), losing their lives in the war. Sometimes these memorials are right under our noses and we don’t even realise what they mean. Athol Thomas Hart’s name is inscribed on the Takapuna School memorial gates. He was twenty seven when he was killed in action, and had been a brilliant lawyer when he enlisted. Although he hadn’t been a student at Takapuna School in years, the school still felt a deep connection with their past students and the gates were a way of remembering them for everyone to see as they walked in to school each day. These memorials were a special way of honouring men like Athol, who would forever be considered part of the school community. You have been given the card for the unveiling of the Takapuna School Gates - where Athol's name is listed. You are now tasked with discovering more of the story behind Athol Thomas Hart. How much of his story can you piece together? The suggestions below will help you on your research journey. The How We Find It Fact Sheet will also be a helpful tool in helping you discover the pieces of Athol's puzzle. You're in luck, Athol served in the New Zealand Army and so his records will be able to be found online at the Auckland War Memorial Museum Cenotaph. This is your most important search. Collect as much information as you can. Once you've found Athol's Serial Number move to Archway and search for his service documents there. Takapuna School raised the equivalent of $156 in one day for the Russian Prisoner Fund of May, 1916. This was just one of many fundraising activities that occurred in schools. Use Papers Past to find other amounts that Takapuna School raised. Then use the Reserve Bank calculator to work out how much that is in today's money. Athol's mother, Sarah Hart, would have had a special card delivered to her with a photo of Athol's grave and the exact location should she ever be able to visit. Use Athol's Service Number to search for the location of Len's grave. Download the Cemetery Plan and use it in conjunction with Google Maps to find his final resting place. . Uncover more pieces of Athol's story. The Free Lance was one of New Zealand’s most popular weekly, pictorial newspapers. It was first published in Wellington in 1900 by Geddis and Blomfield as a spin-off from their successful Auckland weekly, the NZ Observer and Free Lance. Use Cenotaph to locate Athol's brother and learn about his promising career as a "black and white artist" - his work being published in Free Lance. See if you can locate some of his artworks. how did hart road get it's name? Hart Road was originally known as Hansen Road (after Paul Hansen, a Takapuna businessman and real estate dealer, who sold much of the property around the central Takapuna area when it was first subdivided). The road was renamed in 1919 after 2nd Lt. Athol Hart (New Zealand Rifle Brigade), who was killed in France in 1918. His father was E. T. Hart and the family lived in Clifton Road in Takapuna, near Hart Road. Search for other street names that have been renamed after WWI soldiers. Are there streets that could be renamed after a WWI soldier? Follow the steps at Poppy Places to campaign for a street name change. Where is beresford street school? 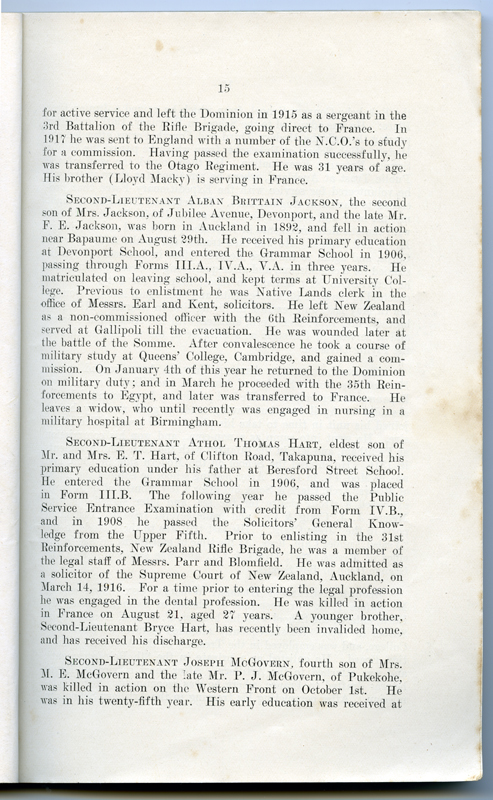 In the Auckland Grammar Chronicle of 1918 the obituary for Athol says that he "received his primary school education under his father at Beresford Street School". Why then is Athol's name listed on the Takapuna School Memorial Gates? Can you work out if Beresford Street School still exists? What is the connection between Beresford Street School and Takapuna School? Unveiling of the gates is connected with the story of Athol Thomas Hart who attended Takapuna School and Auckland Grammar School.The original booklet is held by Takapuna School Archive.It is this project's understanding that Athol has no surviving relatives. The Walking with an Anzac Team found the first clue in Athol's story when they visited Takapuna School. The first thing that greets visitors to the school are the impressive memorial gates, where Athol's name is listed. Further research on the same platforms you have used today allowed us to discover Athol's Story.